Apple is in talks with three major music studios that have held out selling songs on iTunes free of copy protection, according to a report Thursday. If successful, Universal Music Group, Warner Music Group and Sony BMG titles could be part of Apple’s iTunes Plus. Although CNET described discussions as “still preliminary,” an agreement would expand Apple’s iTunes Plus option to include music from all major studios. When the program was launched about a year ago, only EMI signed onto selling tunes free of restrictions that tied iTunes purchases to an Apple device. With its iTunes and iPod dynasty, Apple has dominated digital music sales. However, a growing number of rivals — Amazon, Microsoft and MySpace among them — have used DRM-free MP3 music to loosen the stranglehold. Microsoft is among one of the biggest winners in the non-DRM debate. Universal Music, EMI and Warner Music Group have all signed deals with the software giant. Talk now suggests Sony may announce its own MP3 agreement soon. 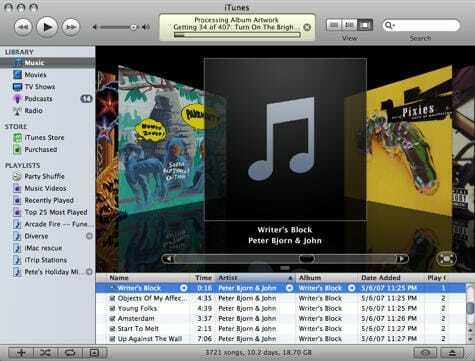 However, Microsoft’s Zune isn’t likely to be dramatically hurt if Apple’s iTunes more widely embraces the MP3 format. songs and playlists, ” Mike McGuire, media analyst at Gartner, told Cult of Mac.